The analysis of 9,186 accidents where a motorcyclist was severely injured, shows that specifically young, male riders face a significant risk to become a road traffic victim. The European Commission recently published the ‘Study on serious road traffic injuries in the EU’. The general objective of this study was to collect knowledge that could in the future prevent serious road traffic injuries. The specific objective was to provide fact-based analysis on the most common circumstances and types of road traffic crashes leading to serious injuries. The study was also directed at providing an understanding of the main circumstances and factors that affect the emergence of serious road traffic injuries, medically coded as MAIS3+, for the following road traffic modes in the European Union: pedestrians, bicyclists, motorcyclists and car occupants. If you download the study, you will find all the data and you can read about the most common characteristics of crashes with severely injured pedestrians, bicyclists, motorcyclists and car occupants. We will now focus on the findings about motorcyclists. Motorcyclist characteristics – Severely injured motorcyclists are dominated by males (91%-96%). Most of them (95%) are the rider of the motorcycle. Dominant age groups are youngsters (18-24 years) and in Sweden, Germany, the Netherlands and the United Kingdom also middle aged adults (around 40 years old). In Germany this group of middle aged adults is the most dominant. 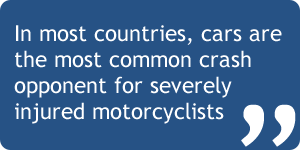 Crash opponents – In most countries, cars are the most common crash opponent for severely injured motorcyclists (42%-59%) and two active road users are involved in the crash (46%-67%). Single vehicle crashes and crashes into fixed objects are also very common. Particularly in Sweden, single vehicle crashes outnumber the crashes where a car is the crash opponent. Impact location – The impact location for severe motorcyclist crashes is most often to the front, with side-impacts as the second most frequent. Those databases that provide information on the manoeuvre, show that a turning manoeuvre or going straight (sometimes in a bend) are common in severe motorcyclist crashes. Location characteristics – In some countries, rural road crashes outnumber those on urban roads: 45%-55% rural crashes are observed in the Netherlands and Sweden. Other countries have most severe motorcyclist crashes on urban roads: 53%-60% urban crashes are observed in Germany and the UK. The study concludes that severe motorcyclist crashes are not a major problem on motorways. Time related characteristics – Summer and spring are the periods where high proportions of MAIS3+ motorcyclist crashes happen. As with all transport modes, crashes happen frequently in the afternoon, between 15.00h and 18.00h. Injuries – For motorcyclists, the body regions most severely affected are most frequently the thorax and lower extremities. Also head injuries and injuries to the upper extremities are common. Thorax injuries are most frequently found in single vehicle crashes and crashes with a fixed object, while lower extremity injuries are particularly found in crashes with a car. 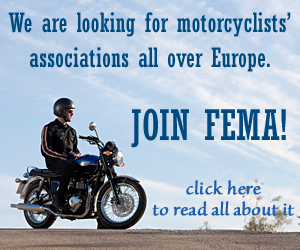 More than 90% of killed motorcyclists were male, although larger shares of female fatalities were found in Ireland and Sweden. 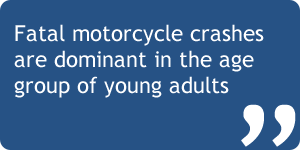 Fatal motorcycle crashes are dominant in the age group of young adults and in some countries also in the group of older riders, especially in central European countries. The majority of fatal motorcyclist crashes occur on rural roads. During spring and summer, most fatal motorcycle fatalities occur. Forgiving infrastructure for all vehicle modes: e.g. 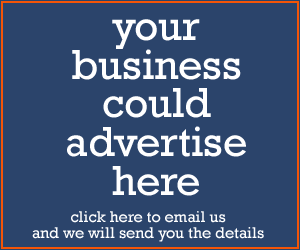 shielded or obstacle free road sides, motorcycle-friendly guard rails and poles. Smooth infrastructure for two-wheeled vehicles, including powered two wheelers: prevention of single vehicle crashes for modes were balance is an issue; bicycles and motorcycles might benefit from sufficiently wide cycling lanes, well maintained pavements and prevention of road surface defects such as potholes and differences in height between the pavement and the road side. The study recognizes that “for some Member States these measures might already be implemented on a large scale, for other Member States implementation might be a real challenge.” The study shows that for all Member States improvements can be made. Source: Study on Serious Road Traffic Injuries in the EU, published by the European Commission, Directorate-General for Mobility and Transport. Click here to read the full study (pdf, 149 pages).